Unless noted all classes take place in my studio 403 in the historic Northrup King Building in Northeast Minneapolis’s Art District - home to over 250 artists. Classes are relaxed, fun and inviting. Click here to visit my Facebook page featuring photos of my students and their creations! Students will create their choice of a glass on glass mosaic featuring a Brazilian agate or a tile mosaic with my handmade tiles. The first day will be designing and adhering the tiles, the second day will be grouting. Students will get a complete overview of mosaicing with tile and glass, the grouting process, and leave with a finished project ready to hang. 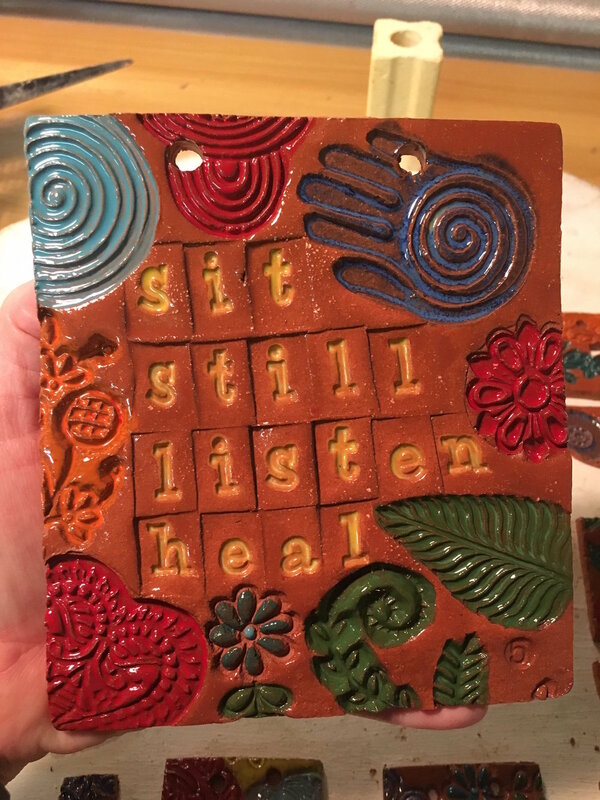 Students will make tiles exploring gratitude and inspiration. The first day will be spent preparing clay, using textures and stamps and cutting tiles. The second day will be glazing and loading the tiles in the kiln. I provide students with approx. two square feet of clay to create tiles of your choosing. Additional arrangements will be made to pick up fired tiles on Saturday, March 2nd or Sunday, March 3rd. Create your own mosaic. I will help you through all stages of creating your own project or make tiles for your own mosaics. We will work together to create a schedule. Cost is based on time, materials and extent of project.